At the Movies by Robin Caroll. A Samantha Sanderson Book. Review: Do you want to read something with action and mystery? Then Samantha Sanderson At the Movies by Robin Caroll is your book. It is the first book in the Samantha Sanderson Mystery series. The main characters are Samantha, Makayla, Lana, and Frank. Samantha is a cheerleader and a reporter for the school newspaper. When she is at a local theater and a bomb is discovered she knows this could be her chance to become editor of the school paper. Then after the bomb is taken care of Samantha discovers her dad is running the case. This gives her a good enough reason to get that story for the paper even though the editor of the paper doesn't like her. While struggling to write her story, Samantha researches potential suspects. She hits a few nerves, and some of her blog entries are taken down. As if that's not bad enough, her dad wants to remove her from the assignment. Will Samantha crack the case of the movie theater bomb? Will her dad remove her from her first big assignment? Read Samantha Sanderson at the Movies to find out. 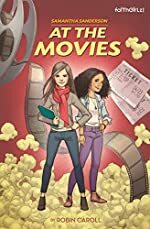 Samantha Sanderson at the Movies is a book with a lot of action and adventure. The book has medium level words so girl's ages 8-11 would appeal to it the most. The book has an easy to understand writing style. Samantha Sanderson at the Movies has great dialogue. The book has some mystery elements to it. I thought that some parts of the book were confusing. It can be use for reading aloud and other activities related. Samantha Sanderson at the Movies has some fear elements. The characters are easy to understand with their motives. The book has a great plot line with many events. This book is one that you will want to read again because it can relate to many things. Overall the book is a good read and will give you elements of fear, mystery, romance, action, and suspense. Review written by Elizabeth (6th grade student). We would like to thank Zonderkidz for providing a copy of At the Movies for this review. Have you read At the Movies? How would you rate it?